Set this to 1/2 your VDDQ. 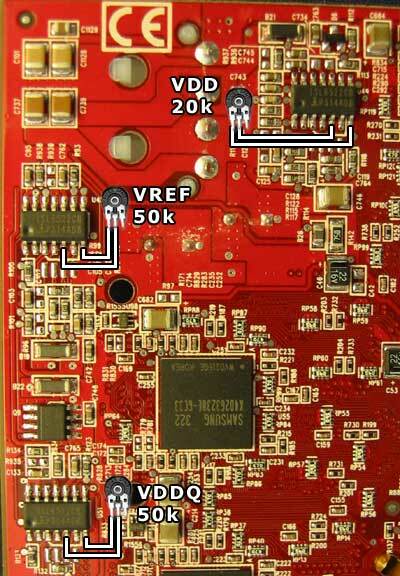 More than 1.5v VREF will probably kill your card. 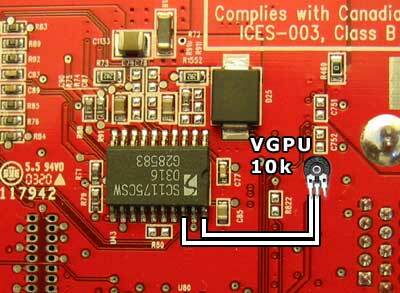 ISL6522 - 50k pot between pin 5 (FB) and pin 7 (GND) measurement point is c136 on other side. Use the middle and either the left or the right pin on the pot. There is no polarity you have to watch. I strongly suggest removing the unused pin so you can't accidentially put the potentiometer there flipped and kill your card with too high voltage. Start with the pot set to the highest resistance (turned all the way from the outer pin you are using) and slowly work your way down while measuring voltage- you can safely change resistance while your system is running. 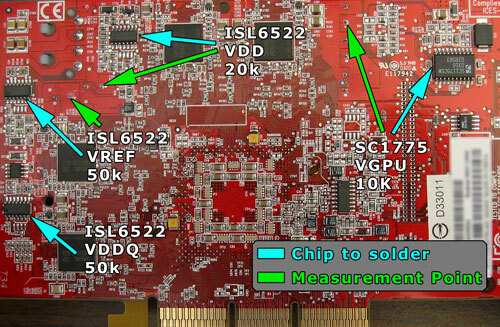 To measure voltages attach the negative (black) probe to your case or another grounded part and carefully put the positive (red) probe on the measurement point. Be careful not to create a short with another of the 'posts' near the measurement point. A better way is to attach an SMD grabber.